Upgrade The Way Your Business Communicates with our Virtual Telephone Systems. In such a technological age, it’s no surprise that businesses communication is evolving. More and more forward-thinking business owners are moving toward voice over internet protocol (VoIP) for their company’s communications. Having a virtual telephone system simplifies collaboration among your workforce and provides a more flexible and reliable communication platform for your company. 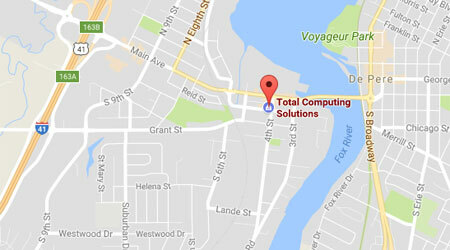 Total Computing Solutions partners with DataGuard Hosting to provide you with secure and reliable VoIP systems. Say goodbye to expensive, complicated and unreliable phone lines. Our business telephony offering will help enhance your company’s operations with a reliable, inexpensive, simple to use, and highly flexible communication system. What are the benefits of our virtual telephone systems? Flexibility: Since VoIP phones route their communications over the Internet, there are far fewer restrictions related to where a phone can be installed. They can work anywhere that an Internet connection is available and do not require conventional telephone wiring. Security: Our VoIP telephone systems are much more secure than traditional telephone systems. They communicate with our hosted PBX system via encrypted connections, dramatically reducing the possibility of unauthorized on-premise call interception. Minimal Equipment Investment: With our hosted virtual telephone systems, you won’t need to invest in expensive, complicated, proprietary on-premise telephone system controllers (PBX systems) again. All of the functionality that those devices provide and much more is provided by our hosted solution. Customization: Our virtual phone systems can be customized to meet your company’s specific needs in terms of call routing and messaging. For example, incoming calls can be routed to any number of phones, internal or external, simultaneously – never miss that important call again, be it the CEO of your largest client, or your mother. Record Keeping: Have a detailed record of calls placed, received, or missed at your fingertips. You can easily return or redial calls from the call log. Electronic Fax: Say goodbye to those clunky old fax machines that just never seem to work correctly and often cost you money just to print junk mail. Our VoIP phone systems can send and receive fax messages in an entirely paperless manner, at a fraction of the cost, without the use of traditional telephone lines. VoIP systems offer you a chance to revolutionize the way your business communicates and operates while reducing your monthly communications costs. For more information about our VoIP solutions or any of our other services, give us a call at (920) 569-2681 or email service@tcsdepere.com to get in touch with a member of our team today.